Yes please! Black, with no sugar. How long will tuning take? Somewhere between sixty and ninety minutes is normal, depending on the condition of the piano. For a pitch raise, allow at least two hours. Obviously if any repairs are to be carried out, additional time will be needed. Do you mind if I/we/the children watch? I'm a teacher; I like an audience! Does the room have to be quiet for the piano to be tuned? How often should it be tuned? In the home, twice a year is generally sufficient. You can get by with an annual tuning but it’s always a “catch-up” and the piano never gets the chance to become as sweet and as stable as it should be. Pianos in daily use by professional musicians and music teachers, and in studio venues, will require more frequent attention. Pianos in concert venues are generally tuned before each use. Will tuning also include fixing half a dozen assorted faults with keys, strings and pedals? Or make the action work better? No. Tuning is just tuning - adjusting the strings to the correct pitch. If the piano has various problems, these will need to be assessed and quoted for separately. Many tuners however (including me) will often carry out small repairs or adjustments for regular clients at no extra cost. Can you get permanent marker off the keys? Probably. It depends on the material the key coverings are made from, and the composition of the marker pen ink. But it’s often possible. Can you get sticky labels off the keys? Yes, that’s not too difficult, though tedious. The Cory range of piano cleaning and polish products is excellent. I can supply them, or see below for details to order Cory products from the UK Distributor. Cory Key-Brite is safe on all keys but is relatively expensive in the UK and I can discuss other possible methods with you. For light cleaning, a damp cloth wrung out in water with a little detergent is fine, then polish with a dry cloth. Don't use methylated spirits or other solvents. The white keys of my old piano are really discoloured - can anything be done to restore them without new key coverings? Sometimes. It depends on the material the key coverings are made of. See the photo at the bottom of this page for a success story. Yellowed ivory can be whitened by a laborious process, but evenness of results cannot be guaranteed. What is the white material on the white keys? The material traditionally used was thin slices of ivory, as it was the most readily available light-coloured material that could be cut into thin wafers. Ivory key coverings are in two parts - heads and tails, for the broad front of the key and the narrow back part respectively. Some very high-grade pianos used single pieces. From the 1880s, plant-derived Celluloid materials started to be used (highly combustible) and various other early plastics, including Galalith, a plastic made from milk proteins. Today various types of plastic materials are used, and manufacturers have their own propriety formulations which are secret. Should I keep the keyboard lid closed or open? 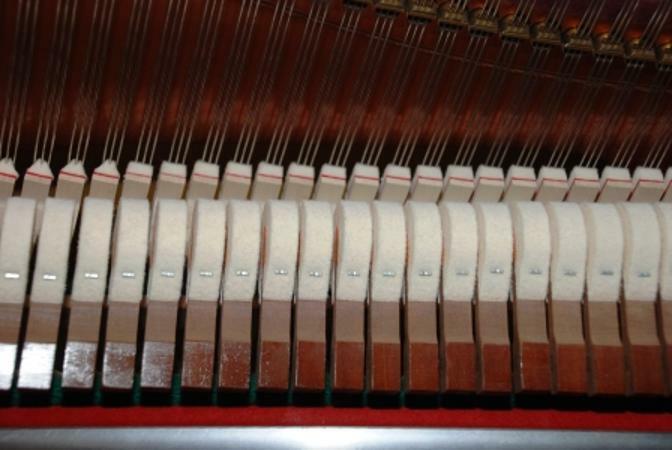 For pianos with ivory key coverings, it is thought best keep the lid (the proper name is the Fall) open. The ultraviolet in sunshine helps to prevent the ivory from yellowing (even though some UV is removed by window glass). For plastic key coverings, the choice of open or closed is a matter of preference. Can you fix my Digital Piano? No. Electronic keyboards need an electronic engineer. Bear in mind that the lifespan of such instruments has been said to be around ten years. (In schools, probably much shorter) Digital Pianos older than that may not be repairable at all. In any case, the technology will have moved on. 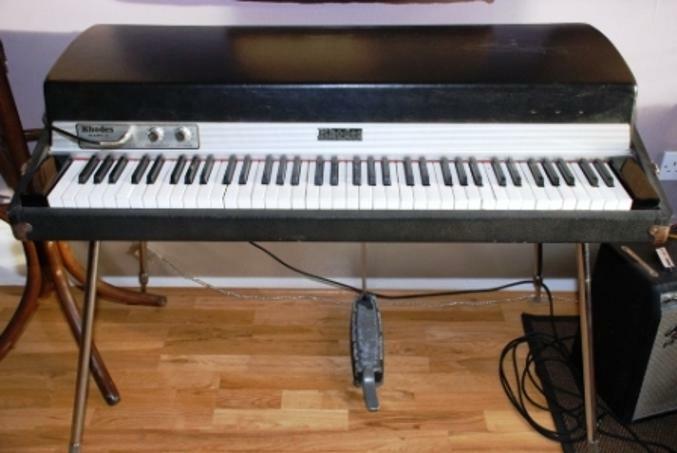 Can you tune or repair my old Fender Rhodes electro-acoustic piano? I can tune it, yes. The scope for repairs is limited. These rather charming instruments are old now, and parts are not available. And a fault in the electronics would require other expertise than mine. Do you work on Pipe Organs? No, that is a different trade, with its own very special expertise. Should I avoid having the piano against an outside wall? In most homes these days an outside wall is OK. The idea formerly was that an outside wall could be cooler than the rest of the room, and if the piano was against it, moisture in the room might condense in the piano. Homes today are more insulated. Does a piano need tuning again if it gets moved? It seems that nothing will ever shake the conviction of most piano owners and players that the two things that make a piano go out of tune are 1) playing it and 2) moving it. This conviction persists in spite of the fact that most tuners are glad to inform their clients that a piano in reasonably good condition goes out of tune for two entirely different reasons: 1) because it is new, or newly restrung, and 2) because it underwent a change in humidity. (from Supplement H, Why Pianos Go Out Of Tune, p188). The chapter goes on to discuss lightweight inexpensive uprights that may be slightly de-tuned by a shift in position on an uneven floor). Is it OK to store my piano in the garage for a while? Even though your garage may be generally wind and water tight, it just isn't a suitable environment for an acoustic piano. To put one there even for a short while is asking for trouble. If you cannot store your piano in a room in the house, or have it professionally stored in good conditions, then it's better to sell it and buy another later. My piano is an antique. Is it valuable? Broadly, no. Pianos have almost no antique value. A very fine old concert grand piano may be worth something, not because it is old; just because it is a high-quality instrument. Exceptions might include: a really unusual instrument of historical interest in the development of the piano; a piano with a special "art case" by a famous designer; a piano formerly owned by a famous musician. In the late 19th Century England had very many small cottage-industry piano assembly workshops churning out cheap instruments made to the lowest standards, for the parlours of lower middle class families who by then had the means to buy them. (See my page on Birdcage pianos ). These entry-level upright pianos were cheap and cheerful and of inferior quality even when brand new, and they were certainly not envisaged to be in use 130 years later. What confuses the issue is that back then, fine veneers and the skills to work with them were cheap. So these “entry-level” pianos of the late 1800s generally LOOK a lot better than they are. My piano's really old and there are broken action parts. Can you fix it? Broken action parts can generally be fixed or replaced. But generally in a piano that's really old, everything is very worn and action components are fragile. The chances are that if a few parts are broken, other parts are going to break too. It's a matter of weighing costs against benefits. I will be very happy to advise, on examining your piano. There is a split in my piano's soundboard; what should I do about it? Were older pianos better made than modern ones? There have always been cheap pianos and expensive pianos. The cheap ones have always been poorly made, and expensive ones well made. See the question on antique pianos, above, for comments on 1880s English budget-range pianos. Some fine older pianos are very interesting to work on and show much evidence of thoughtful design and careful craftsmanship. Certainly too, in some of the older pianos you find wonderful slabs of hardwood the like of which are not to be found today. But today's entry-level pianos are generally much better than the low-end pianos of the late 19th century, even if they lack some of the beautiful veneers that were cheap back then. Fine-quality pianos are still fine, and still beautifully made. And priced accordingly! Recent times have brought some interesting new materials into piano manufacturing, and I may put up a separate page about piano materials in due course. This was my great-granny’s piano. It’s of sentimental value and I could never part with it. Can you make it good? Not if it wasn't good to begin with. And even if it was good, but is now very old, probably not. Don’t be too sentimental about a piano. Your great-granny wouldn’t have wanted you to be. If it’s worn out, it’s worn out. If great-granny’s piano was one of those low-grade cheap English pianos mentioned above, then it was undistinguished even when brand new, and it owes no-one anything. If you like the look of it, turn it into a drinks cabinet. If you want a piano to play and enjoy, buy a new one. Your great-granny did. It is in any case noteworthy how firmly the fingers resist the claims of sentiment when it comes to opening the wallet to spend money on the Sentimental Piano. Can you make the action of my piano heavier/lighter? To alter the overall feel of a piano's action is a very complex challenge. There is no easy "Light and Heavy" adjustment. A thorough regulation of a badly regulated piano action will make it much better to play. But action regulation is a painstaking and very time-consuming process involving many adjustments for each individual note. In short, changing a piano's 'touch' is not a simple matter. In older pianos, the use of appropriate specialised piano lubricants in certain places can make some difference, if sluggishness of certain action centres is a problem. I have a Lindner piano from the late 1960s and some notes don't play. Can it be repaired? For more on the Lindner pianos see the Lindner page of this site. Do you cover Ayrshire? Glasgow? Renfrewshire? Dunbartonshire? Lanarkshire? Highlands & Islands? Western Isles? The Borders? Yes, but you will appreciate that a visit to a very far-off location is not economical for a single piano tuning (unless the owner is willing to factor in the extra travel and time costs). Where can I obtain Cory piano cleaners and polishes, or piano stools and other accessories? The UK piano trade supply house Heckscher & Co supply a limited range of products direct to the public. How can I find out about the age of my piano and the history of the make? Serial numbers for the larger manufacturers have been collated and listed in a couple of books. The best for the UK isThe Musicians Piano Atlas. I can look up the serial number in this book for you or you may be able to find information online. Many of the small piano-making workshops of the past went out of business a very long time ago and left no records. So there are a great many very old pianos of which one can tell little more than the approximate age, judging from the construction and style. Bill Kibby of pianohistory.info has a lifetime's experience in the UK piano trade and has collated a great deal of information on British pianos and their makers. His website contains an incredible wealth of material including many photographs. In addition, for a modest fee, Bill will compile any information he has on your piano into a report. Where do new pianos come from? China, Indonesia and Japan, with a small number still being manufactured in Europe and the USA. And a few very high-end pianos from Wayne Stuart & Sons in Australia. The industry is vastly different today from fifty years ago. Some very fine pianos are being produced in China now, unlike the Chinese pianos of even twenty-five years ago. The Pearl RIver factory in Guangzhou - just one of China's eight hundred piano factories, is the world's largest piano maker, producing more than 130,000 pianos a year. Pearl River pianos appear in the UK under various old European names. They are well made instruments. I also find pianos made by the Hailun factory to be excellent. Those too appear under various old European brand names. What pianos were made in Scotland? As far as I can discover, none. Scotland never developed a piano manufacturing industry. Certainly the means existed to provide everything required - foundries, transport links, all kinds of engineering and so on. But I think probably it was a matter of population density. The UK piano trade a century ago was largely concentrated in Camden, London. You do see pianos "branded" as coming from a supplier in Scotland, but those were bought in from London factories and "finished" by retailers. Will you call out and inspect my piano for free? Not for free, no. And I'm a teacher of English and won't come out and inspect your child's English homework for free either! Must piano technicians be able to play the piano? No. The actions and theory of tuning are quite different from playing the piano. Indeed, the tuner strikes the keys quite firmly in a rather 'unmusical' manner, to ensure tuning stability. It's fair to say, however, that tuners generally love pianos and the piano repertoire, even if they are not themselves accomplished pianists. Sixty or more years ago, when Britain still had a busy piano manufacturing industry, there were lots of apprenticeships, and maybe in that era some young people, generally boys, would find themselves guided towards a training just because it was there, not because they loved the piano. That's not to say, however, they they didn't become excellent tuners. Or to suggest that back then there wern't those who got into the trade out of love of the piano. But today, probably all of those going into this field do so because they really like everything about pianos, piano music and the technical aspects of the instrument. It would certainly seem desirable, too, for the tuner to be able to play a tune or two to try out the instrument once he or she has finished tuning. For an example of a tuner technician who can do much more than play a tune or two, check out the website of Rochdale/Manchester piano technician and concert pianist David Daniels . The photo below shows old celluloid piano keys that were highly discoloured. Ordinary cleaning methods were ineffective. My secret method was used!